Brotherly love often erupts into brotherly competition. 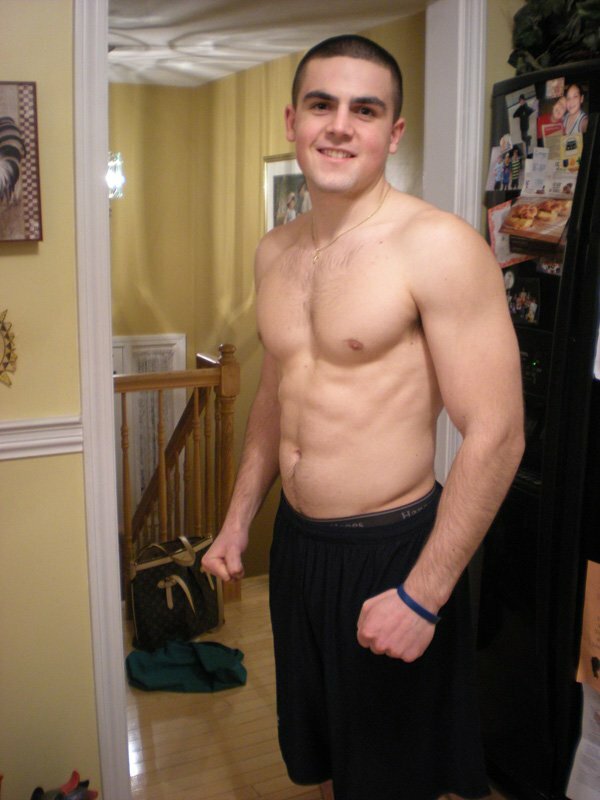 When Jonathan's younger brother got stronger than him, he pursued fitness like a wild man. I was in my freshmen year of college. I had barely touched a dumbbell before in my life. Weightlifting was the last thing on my mind. I was much more concerned with experiencing college and living the "four best years of my life." I was finally in a dorm and living on my own. No more answering to parents and more time to do the things I wanted to do. So I did what any typical college student would do: be lazy, play video games all day, and pig out at the dining hall. I was definitely becoming somewhat of a slob. During one of my weekly phone calls home, my father told me that my younger brother had started working out. No real thoughts from this came to my mind besides "good for him." I continued on with my college lifestyle and progressively I started gaining weight. I wasn't so much getting fat, but I was definitely not headed in the right direction. About a month or so later I made my first trip back home. As I walked in, I joyfully went through the house, grateful to see my family again after time away. I then asked my parents where my younger brother was. They told me he was downstairs working out. As I entered the basement, I could not believe my eyes. There was my brother, except a much bigger, stronger brother from when I had left for school. My head was immediately rushed with emotions of anger, jealousy, and of course respect. I complimented my brother of his accomplishments, and quietly walked away. As I returned back to school, the thought of my younger brother of 3 years being stronger than I was ate me up. I am supposed to be the bigger, stronger older brother; I can't let him tower over me. As I sat in my dorm I realized I had to make a change. Then, I made a commitment to myself; I was going to start going to the gym. Not only go to the gym, but go to all my classes, do all my homework, and really start taking control of my life. A few days later, I received a basic lifting routine from one of my friends. As I walked the path to the school gym for the first time all semester, I thought to myself, "This is day one of a very long, bumpy road ahead." I am proud to say that to this day, I am still fighting my way down that long road and I do not see quitting in my future. I love Dr. Jim Stoppani's 12-week Micro Muscle workout program. I love it because it changes every week, so it constantly keeps you and your body guessing. By changing weight, reps, and sets week to week, you can't help but grow. I've seen some really good results from this workout. How the workout works is in week one, the rep range is 12-15. Then in week two you add weight and lower the reps (10-12). You continue this pattern until the reps are 1-3. Following the 1-3 rep range, the next week you return to the 12-15 reps. Here is an example of week one. Hey little bro ... how ya like me now? Nutrition is huge. I lacked knowledge in nutrition for the longest time and it showed through my body. Once I started learning more and more and cleaning up my diet, the results started coming in a lot quicker. I train every morning at 6 a.m, the only meal I have before my workout is breakfast 1. Following my workout, I pick up were I left off with breakfast 2. Here is what a normal, training day would look like. I try to have the majority of my carbs before 3 p.m. After that I stick to protein and healthy fats. Some carbs still sneak in there with the greens but that's OK. This nutrition plan has worked well for me. The way I look at it, if you put good in, you get good out. I love protein powder. You always need a good protein powder in your supplement stack. Without it, you're really slowing your progress. I really like using ON Gold Standard Whey protein powder. I also really like using BSN Syntha-6. I take 1 scoop before my workouts, 2 scoops post workout, and 1 in the afternoon. I also love pre-workout supplements. I have really been able to push my limits with pre-workouts like Cellucor C4, Gaspari SuperPump MAX, and BSN Endorush. These are my top-3 pre-workout supplements. I cycle creatine off and on. My creatine of choice is definitely ProMera Health ConCret. I take a multivitamin and fish oil also. That's really all the supplements I use - got to keep it simple. I love working out because of the rush that you get from it. There is nothing better than pulling up that last dumbbell row, re-racking after that last bench press, and fully squeezing your biceps as you complete your last curl. I love knowing that I pushed myself and the results come as a reward. There is no team in bodybuilding; it is just you out there. If you cheat, you're cheating yourself. If you don't push yourself, you don't succeed. There is no one else to rely on, you control the outcome in the gym and I love that. I love working out most though because in the gym is where I feel my absolute best; it is my sanctuary, and I am thankful that God blessed me with the ability to lift weights. Living a fit lifestyle is the best way to live. I get motivation almost everywhere I look. My family is so supportive of my efforts in the gym. They see me and they ask how my workout went, what my body goals are for the future. Seeing their concern gets me so fired up. Knowing that they are keeping me in-check makes me want to keep pushing. Seeing my friends and "foes" in the gym keeps me going as well. I like to think I am also self-motivated. My constant pursuit of perfection is/has kept me going 110% since day one and I don't plan on slowing down anytime soon. It's addictive, this whole lifestyle. Eating right, sleeping adequately, and training hard. You just get so use to it and ultimately end up falling in love with it all. As I said earlier, I hit the gym every morning at 6 a.m. 5 minutes after I wake up, I am wide awake, I am ready to hit this day with a purpose and get after it. Watching the sunrise through the windows of the gym as I perform rep after rep gives me the confidence that I can accomplish anything. All those reasons and a million more, keep me motivated to follow a healthy lifestyle. 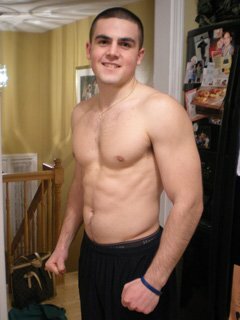 Seeing my brother more muscular than I was originally made me want to achieve my goals. Now that two years of hard training has passed and progress has been made, I want to see how far I can go. Knowing that the sky is the limit is what makes me want to achieve my goals. Well, my number one goal is to continue to build a bigger, better physique. On top of that, I would love to step on stage this summer and compete for the first time. I feel like I have a lot more work ahead of me though until I will be stage ready. I really would like to be featured in a fitness magazine. Whether it be Muscle & Fitness, Flex, Men's Health, any of those muscle magazines. I love flipping through those magazines and seeing these amazingly built guys featured on every page. To be able to lie on a page of one of those magazines would be such an honor. Also I would love to attend the Arnold Classic Expo this year! We thought the freshman-15 was supposed to be slapped on, not burned off in the weight room! Never quit. Stick with a routine and continue to make strides. Weightlifting is a mental act, as much as it is a physical one. So many times your mind will tell you to quit, to give up and stop going to the gym. You need to be headstrong through these tough times. You need to stay positive and blast through these plateaus. Whether it be a mental plateau or a weightlifting one, you need to believe in yourself and your abilities and barrel through it. When you finally get to the finish line and look back on the progress you've made: when you see where you are, compared to where you came from, you'll be glad you never quit. Greg Plitt is definitely number one. He has an unbelievable physique. I love his workouts and the mentality he takes every day. I strive to one day be like Greg Plitt. I really like all the physique competitors for that matter. Ryan Hughes is definitely up there. Steve Cook, Alex Carneiro, Matt Acton, all these guys have athletic builds that just leave you scratching your head wondering how they got there. One day, I'll be up in the ranks with these guys. I literally spend like at least 3 hours per day on Bodybuilding.com. I really take advantage of the site with all that it has to offer. I buy my supplements here, read product reviews, use BodySpace, and read the SuperSite. The site seriously has everything a fitness guru could ask for. Best website on the web, hands down. Keep up the great job Bodybuilding.com!